This May 10, 2017, file photo shows Kellyanne Conway, an advisor to President Trump, at the State House in Augusta, Maine. 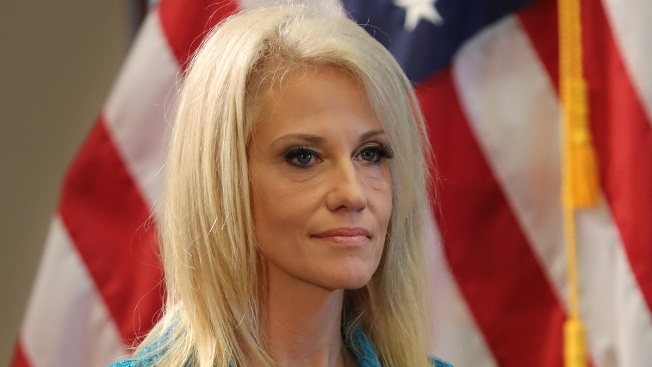 President Donald Trump's counselor Kellyanne Conway has told supporters in New Hampshire they should "just ignore" his critics and the incessant chatter about the scandals dogging him. The crowd was largely friendly to Conway, applauding when she mentioned Trump's proposed tax plan and efforts to overhaul the health care law. Some people in attendance withheld applause when Conway let loose with snarky comments about Democrat Hillary Clinton. Conway encouraged the room full of Republicans to pivot from being the party of the job creators to become the party of the job holders. She says people who have "one, two and three jobs" make up more of the voting population and "turned this election."